Posted August 6, 2007 in Articles and Quetico Park People. Most people come to Atikokan, Ontario to paddle canoes; the Robinson’s, however, came to Atikokan to build them. They also happily put their own canoes to use by paddling the numerous lakes, rivers and creeks that are found on this portion of the Canadian shield. Atikokan is justifiably known as “Canoeing Capitol of Canada”. In addition to Quetico Park, it has the White Otter Wilderness area to the north and numerous lakes and river systems accessible by logging road or by float plane. 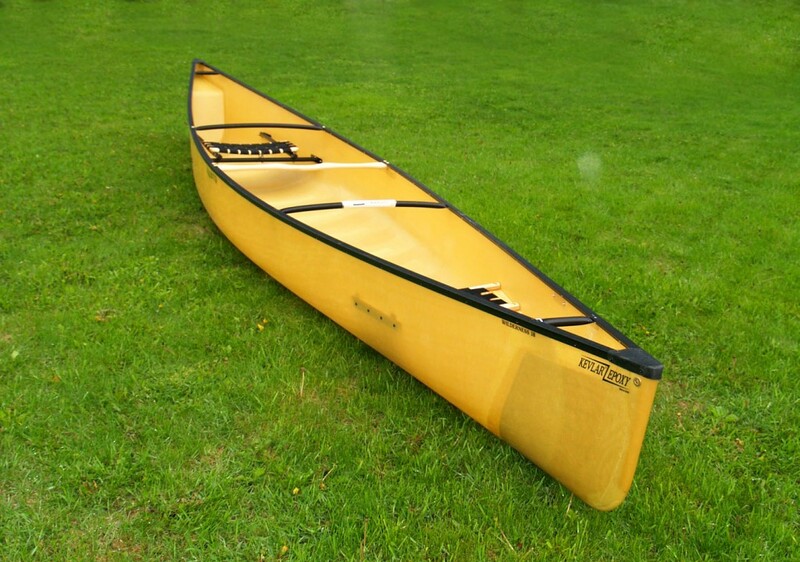 The Souris River Wilderness 18 is one of many canoe designs that Souris River makes. Keith and Arlene Robinson started the Souris River Canoe Company along the banks of the Souris River in southern Manitoba in 1985. The Souris River is thought to be based on a Sioux name that means “foaming river” because of the foam that forms below small rapids and rocks. The early French explorers and traders translated “foaming river” into French and called it the Mousse River because “mousse” means “foam” in French. Then, in an example of multicultural miscommunication, English speakers evidently simply changed Mousse River into Mouse River. In the final twist in this tale of the mouse, later French immigrants then converted the Mouse River into Souris River. “Souris” means “mouse” in French and it may have been called Mouse River because it is a narrow river that twists and turns like the tail of a mouse as it meanders through the prairies of Saskatchewan, North Dakota and Manitoba. Some people, including the Robinson’s, prefer a different explanation of the name. “Missouri” means “large canoe” in one of the Sioux dialects and “souri” means “small canoe”. They named their company Souris River Canoes since they were making canoes in Souris, Manitoba, along the banks of the Souris River. The recreational canoes they built were “small canoes” compared to the voyageur and other trade canoes that traveled down the Souris River in the 1700’s and 1800’s. Prior to building canoes, Keith and Arlene lived in Snow Lake Manitoba. Keith worked as an environmental scientist at a copper-zinc mine and Arlene taught music in the high school. During this time they both did a lot of canoeing on the numerous lakes that surround Snow Lake. They honeymooned on the Grassy River south of Snow Lake and continued to use canoes to explore the rivers and lakes that surrounded them in northern Manitoba. They got involved in marathon canoe racing in the early 1980’s. While racing, they got to know Everett Crozier, a canoe builder from Wisconsin and were inspired to start a canoe business. With the enthusiasm and brashness of youth, they moved to Souris, Manitoba and started Souris River Canoes. Keith used a mold he obtained from Everett, a man who was also influential in some of the designs of Wenonah canoes, and the first canoes Keith made were based on the designs of Eugene Jenson. Keith decided to incorporate some of his own ideas and began designing his own canoes while in Souris, Manitoba. The market for canoes in Manitoba was limited so he could only sell about thirty-five canoes a year when they were in Souris. It was almost impossible to break into the United States and southern Ontario markets from Souris, Manitoba so Keith and Arlene decided to look for a location that was closer to the markets for their canoes and that also had other attributes they were looking for. They were hoping to find a small town that had both good canoeing and cross country skiing that would also be a good place to raise a family. Since they wanted to stay in the northern lake country, they began their search in Kenora and Fort Francis and worked their way east. They finally knew they were in the right area when they noticed that there were more vehicles traveling down Highway 11 near Atikokan with canoes on top than there were pulling boat trailers. Arlene heard about Quetico Park when she was in high school in Souris, Manitoba and she and Keith took their first canoe trip in Quetico in 1991. Started at French Lake with their two young children, Josh and Beth, and paddled into Pickerel Lake. They were amazed at the number and size of the sand beaches on Pickerel Lake, something not common in northern Manitoba. The combination of sand beaches, exposed bedrock, and large trees was very appealing to them. The dynamic crossroads of the northern boreal forest and deciduous forest in a landscape that is almost half water is what makes Pickerel Lake and the rest of the boundary waters area so appealing to the Robinson’s and other outdoor enthusiasts like them. The Robinson’s moved to Atikokan in 1992 and set up their canoe business in an empty building not far from the Atikokan River. They moved from a town named after a mouse to one named after caribou and they hoped that their canoe business would have a similar growth spurt. Their company has grown in size, but it has remained a family business. They are still working out of the building they bought in 1992. Wayne Docking, a retired teacher who has worked for Keith for five years, told me that Keith is “dedicated to designing and building the best composite, ultra-light, wilderness tripping canoe in North America.” He learned the basics of making composite canoes from Everett Crozier and has gone on to design the Quetico (in three lengths), the Wilderness 18, and a solo canoe called the Tranquility. Keith and Arlene canoe with Josh and Beth every summer in Quetico. The entry at Lerome Lake is a favorite of theirs since it takes them into Cirrus Lake, a large, three-section lake with little human activity. It is also gives them access to Quetico Lake, one of their favorite lakes. Quetico Lake with its big, dramatic cliffs, pictographs, sand beaches and rocky, secluded bays is one of the most diverse lakes in Quetico. Josh and Keith Robinson paddling near Atikokan, Ontario. One of their most memorable trips occurred when their kids were young. They flew into Clay Lake and paddled down Greenwood Creek into Quetico Park. Just as they entered the park, they paddled around one of the many sharp turns in the creek and got a close up look at a large bull moose. The kids, who were only 3 and 5 years old, went wild when they saw the moose. What a wonderful introduction to Quetico! Keith and Arlene had some hair-raising moments going across the bigger lakes Josh and Beth would move around at times when they should have stayed still. Keith said that, on one especially windy day, they were close to tipping. The experience contributed to his grey hair and the experience provided inspiration to design the Quetico canoe. They zig-zagged through the northeastern part of the park and ended the trip crossing Nym Lake as the full moon was rising on their right as the sun was setting to their left. They were mesmerized by the beautiful, but very different, colours of the moonrise and the sunset on opposite sides of the canoe. The outdoor adventures with their parents has had a lasting effect on their children. 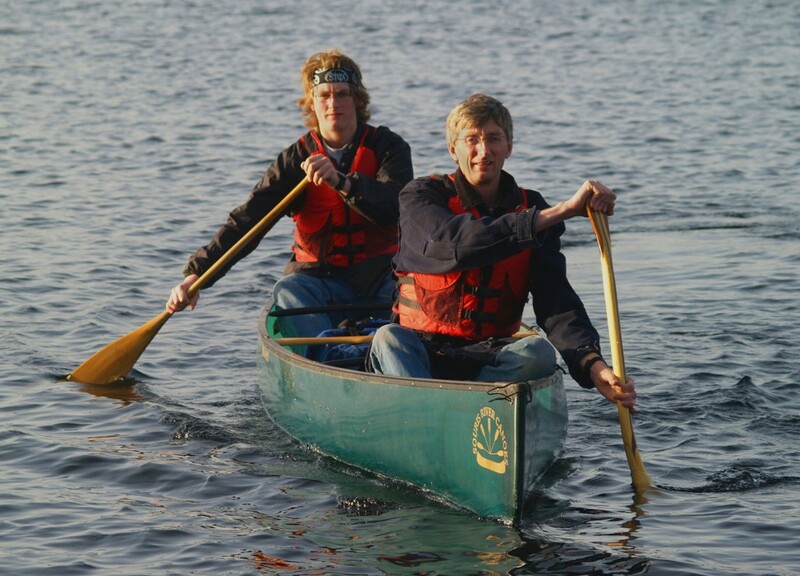 Josh and Beth both participated in the Atikokan High School outdoor education program called ‘Outers’ and are active canoeists, hikers and cross country skiers. Both Keith and Arlene are avid cross country skiers and they felt that the potential for cross country skiing was an important factor in deciding where they were going to re-locate. There were no developed ski trails when they moved to Atikokan in 1992. Arlene was instrumental in starting “Beaten Path Nordic Trails” ski club and was president for a number of years. The club has grown steadily and now has over 100 members and 35 kilometres of groomed trails. To help with fund-raising for cross country skiing in northwestern Ontario, the Robinson’s have provided canoes for an annual fund raisers for the Thunder Bay National Team Development Centre, an organization that that trains promising, young cross country skiers, and the Kamview Nordic Centre in Thunder Bay. The money raised has been put to good use ñ three former Thunder Bay Development Team cross country skiers participated in the 2006 Olympic Winter Games. Beaten Paths hosts a race in February called the Chocolate Cup, where all participants get chocolate. Winners also receive a trophy made from chocolate and many skiers undoubtedly eagerly consume their chocolate while recovering from the race. The lure of chocolate and the opportunity to ski the Atikokan trails attracts many people from Thunder Bay and the surrounding area. The ski club also hosts two events that take place in Quetico Park. Their goal is to get more people to experience Quetico Park in the winter. The Sawmill Lake Tour, which had its inaugural run in January of 2006, covers 24 kilometres and follows old logging roads from the 1960’s and early 1970’s in the northeast corner of the park. This tour is used as a fund-raiser for the Friends of Quetico and skiers who participate in this tour can make donations to the Friends of Quetico. Keith and Arlene have been active in The Friends of Quetico and Keith served as the chairman from 1998 to 2003. Keith’s main accomplishment while serving as chair was the publication of “Quetico Provincial Park: An Illustrated History” by Shirley Peruniak. Although Keith is no longer chairman, he continues to make important contributions. The current chairman, John Soghighan, told me “Keith leads from any seat at the table with adroit insights, gentle reminders and subtle humor.” It isn’t surprising that Keith and Arlene have been active in the Friends of Quetico during their years in Atikokan since Quetico Park was the biggest factor in attracting them to the area. The Robinsons have demonstrated a keen interest in the future of the boundary waters area that goes far beyond making canoes. Robin Reilly, the Quetico Park superintendent, stated that “Keith and Arlene are consistently looking for ways to promote the park and encourage sound environmental management.” With their involvement in environmental concerns and other community activities, they are carrying on the wonderful tradition of many of the entrepreneurs on both sides of the border in the boundary waters area. They are concerned with more than economics and with more than just canoeing. They simply strive to make their communities, and therefore the entire area, a better place to live.